ROBERT FUSARO: KARATE FOR LIFE. Interview By Andrea Carbon. HEEL OR BALL OF FOOT? THE EMPHASIS IN TURNING: By Tom Kompier. NEW-FANGLED KATA. By Scott Langley. THEORY vs PRACTICAL APPLICATION. By John Cheetham & JC Dye. SLATER WILLIAMS. TEN NO KATA: By Graham Knight. MIKE CLARKE. TRADITIONAL VALUES: By Bill Burgar. ROBERT FUSARO Interview: part two. By Andrea Carbon. 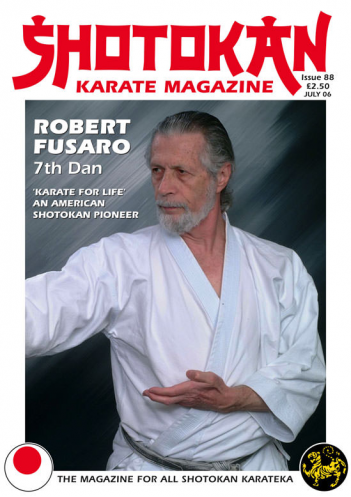 I have been trying to get an interview with sensei Robert Fusaro for about fifteen years now! However, I have kept on trying to pin this great karate-man down and now we finally have a fantastic in-depth interview with someone who many would say is ëtheí most senior western Shotokan instructor in the world today, maybe not in terms of rank but certainly in time training. Fusaro sensei actually started his karate training in Japan in 1955 at the original JKA dojo in Tokyo and later on his return to America he became an original student of Nishiyama sensei, with whom he still trains to this day. A quiet man who has never sought fame or publicity. This most fascinating interview covers a vast array of topics, with a special emphasis on the health aspects of training; meaning looking after your body, not just for karate, but for life! He says in the interview... "I would say that the most important thing is your health. Health and fitness must come first because without these you can't train." Many Shotokan groups do not use or practice the Ten No Kata, yet it is certainly a part of Shotokanís history. The late Kase sensei taught this kata to his students and we have (in this edition) one such student, British karateka Slater Williams, who both physically performs the kata and also explains about the origins and reasons for maintaining the kata. There is a very different slant from the JKA Shotokan which most of us are familiar with and have grown up with. I myself coming from a JKA style Shotokan background found this most interesting and hopefully many others will also. The Ten No Kata is very basic in form but with extensive use of the rooted stance, fudo dachi, which makes a huge difference! 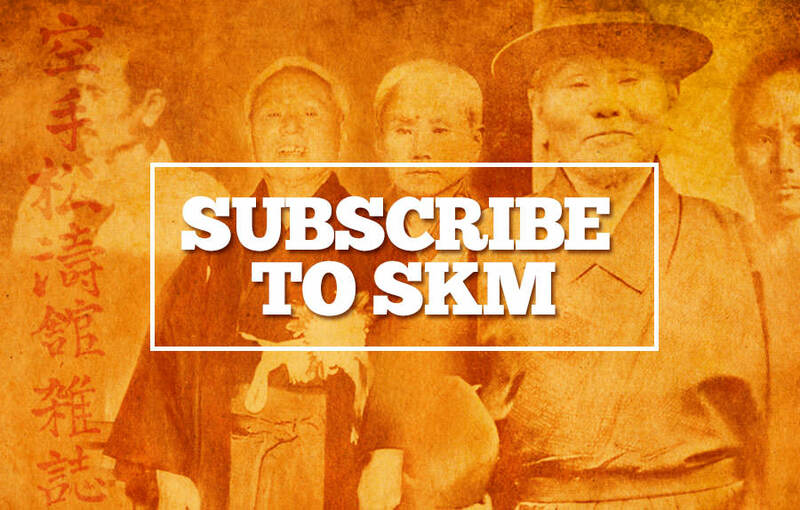 Mike Clarke has been writing for SKM for over 15 years, and love him or hate him, he is the type of writer who makes you 'think' about things, even if you either agree or disagree with his views! This is actually the first interview we have done with Mike Clarke and thank you to Bill Burgar (author of the best selling book, 'Five Years One Kata') for doing this exclusive interview for SKM. Tom Kompier's article is more or less a follow-on from Richard Amos' article in issue 86. Tom has taken this topic a stage further, and whether it interests you or not, bear this in mind; if you train in Shotokan or any other Traditional style of karate, in a dojo environment, in 'bare-feet', then twisting and turning without damaging ankles, hips and knees in the process, (which we know definitely can happen) is an important point worth considering very carefully! So, obviously correct biomechanical movement is paramount in terms of one's health. It's not just about being over-obsessed with correct form, as some have suggested. Scott Langley brings up a very topical issue regarding the amount and various types of kata which are practiced within Shotokan. Many Shotokan groups have introduced more than the standard 26 kata; views on this development do vary! Scientific Theory v Practical Application By John Cheetham and JC Dye. This article is in fact in two-parts, in as much as two alternative methods for a technique are discussed. JC Dye (a Shotokan karateka from Bedford U.K.) offers a very good scientifically based theory in favour of the traditional 'corkscrew' punch, as used exclusively in kihon (basics) and kata, in almost all the traditional karate styles and certainly in Shotokan. My version of events totally relies on practical experience and physical application of both the corkscrew punch and a different method/application. We will begin with JC Dye's excellent explanation. As always, no one is saying what's right or wrong, we are just offering various views opinions, facts and findings etc. The Corkscrew Punch: Why is it so Effective? In studying the wrist release in Heian Shodan, moves 3&4, it is obvious that the twisting of the wrist is very difficult for the attacker to prevent. This is a similar technique to that at the end of the corkscrew punch and consideration of the mechanics explains its effectiveness. For example, if the student holds a long rod at the centre, it is quite easy for even a young person to twist it by turning the ends. The longer the rod, the easier it becomes. If we think of the width of the wrist as a very short rod, it is clear that quite a large force is needed to prevent it from twisting. No great original thought here. The 'corkscrew-punch' employs a similar technique at the end of its travel, whereby the fist twists palm down by half a turn but also progresses forward about an inch. This is due to the straightening of the arm as the elbow rises and the forearm bones cross over. The reasoning for the Heian Shodan movement applies again here: this action involves a very strong force. Driving a screw into a piece of wood gives a picture of the action. The screw is virtually unstoppable due to the force of the twist, called the turning moment. The action of the screw is itself based on the mechanics of the ramp. The longer the slope in relation to the height gained, the greater the advantage. A quick calculation: If the fist moves forward 1cm and the wrist diameter is 8cm, the amount of rotation is about 12cm (half the circumference = pi times rad) so the advantage is about 12 times. That is, the twist at the end of the punch would multiply the final force by that amount. This explains the penetrating power of the corkscrew punch and also one way to deliver the 'one inch' punch! Work done by the punch does not depend on its speed. However, for maximum power, kime or tension should be cut in at the instant of contact and be as brief as possible. I think of the corkscrew punch like a hammer hitting a nail rather than a thrust. The Practical Application: By John Cheetham. Most karateka can only dream of doing a full box-splits as demonstrated by Kagawa sensei. After practicing the corkscrew punch since starting Shotokan karate over 30 years ago and still of course using this punch exclusively during kihon and kata in the traditional method, I totally agree with what JC Dye has stated in terms of the 'theory' of this technique. However, humans are very strange 'machines' and sometimes scientific theory can have very grey areas when a human body is used. I think one of the best examples of this is the 'box-splits'! Every karateka I have ever met would dearly love to be able to do the full 'box-splits', because of the flexibility angle and range of kicking possibilities etc; perfectly demonstrated here (in the photo below) by Masao Kagawa sensei 7th Dan. Now, it's a scientific, biomechanical 'fact' that anyone who can hold their leg out to the side at a 90 degree angle should 'in theory' be able to do the full box-splits - just like sensei Kagawa's (?) "REALLY?" So if you can stand fairly upright with your leg out in a yoko geri ke-komi position (even holding on to a wall or whatever) and get your kicking leg to a 90 degree angle from your support leg, then there is definitely 'no' scientific, biomechanical reason why the other leg cannot do the same, meaning if you were on the floor you could be in a full box-splits! The only thing holding you back is muscle tension and stiffness in tendons and ligaments etc. Otherwise the human body has no bones restricting this action at the hip joint. However, we all know only too well, that it does not work quite as simple as that with human bodies (for all those stiffness and tension reasons mentioned previously). So, here is a case where 'theory' and 'reality' most definitely cross wires and don't compute! I personally have absolutely no scientific background whatsoever so I can only offer what is best described as practical experience and hands-on, experimental application. 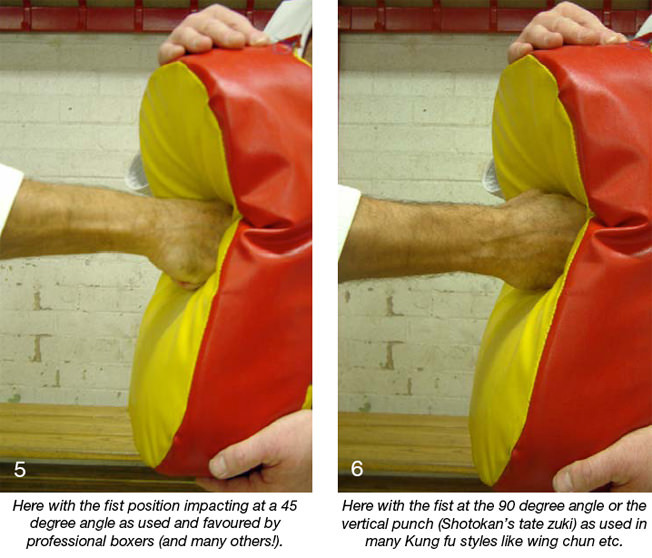 Before any explanation please take a look at photo's 1 and 2 showing the final fist position (on impact) of the most commonly practiced traditional 'corkscrew-punch' (photo 1) and also the final fist position (impact) of the punch with the fist on a 45 degree angle on impact (photo 2). I now strongly believe that there is 'no advantage' whatsoever in using the 'corkscrew-punch'. And in fact I believe the punch landing at a 45 degree angle on impact is equally, if not more effective for most people. Remember that Boxers (who obviously specialise in punching techniques) use the 45 degree angle punch and do not use a karate style corkscrew punch, of course many people will argue that the traditional karate (corkscrew) punch is in fact unique as far as punching techniques are concerned. Many of the Chinese kung fu styles, for example, wing chun, impact their punch with the fist at a 90 degree angle. 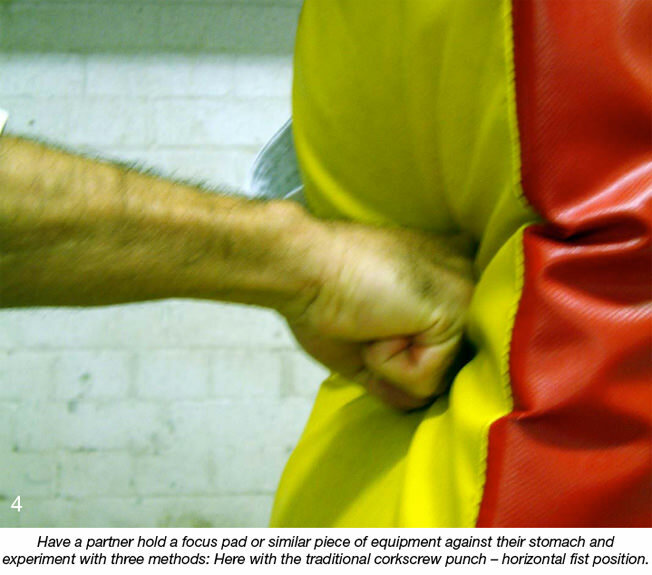 This of course is exactly the same as the Shotokan tate zuki (or vertical punch) as used in kata Chinte, (see photo 3). Now, I am 'not' saying, "Dump the corkscrew punch," far from it because we (at our dojo) use the traditional punch all the time in normal dojo drill training, but what we have found through extensive 'impact' training (using a partner) is that the 45 degree angle fist is actually more effective for most people. Also, and very importantly, I have spoken to many very experienced female karateka over the years and they all say the same thing; that when they hit an object with maximum full force, be it a body, makiwara, bag, shield, pad or whatever, they often hurt their wrist when using the traditional style, corkscrew punch, for the simple reason that their power and force has developed (over the many years of training) to such an extent that it now 'out-ways' the ability of their 'wrist' to actually, physically absorb such accumulated power and so, their wrist buckles under the pressure, which can lead to serious damage! So they often choose to use the 45 or 90 degree angle punch when actually making contact. This also applies to many kyu grade male karateka who have not strengthened their wrist sufficiently to absorb the shock! If you use a pad (as in the photo's) held closely to the body and experiment with three fist positions (photo's 4-5-6) as discussed, you may be in for a few surprises! In this particular instance it's no use trying this experiment on a makiwara because you will not get any feed-back from a piece of wood! However, a fellow student holding a pad against their stomach will 'definitely' be able to put you in the picture in terms of your impact effectiveness! Or lack of impact effectiveness! Try it and see; it's good fun too, and why not (?). As with all technical articles of this nature, the general rule is; "Different strokes for different folks." We must keep an 'open mind' and never be afraid of experimenting with different methods to discover what works best for ourselves!